← The Sick. It won’t Go Away. Last night William woke, crying, around 10:30pm (after having been asleep since 7:45pm), Tony went to soothe him, but nothing he was doing was working. I was downstairs working on taxes, so I saved my work and turned off the computer. I headed to William’s room to talk to him. He said he wanted to nurse, but he kept flexing his legs and crying, so he wasn’t maintaining a latch. He continued to cry, sobbing out answers to me as I asked him questions. He told me his knees hurt. I asked him if it felt better if he extended his legs, or curled them up, he said both hurt. I set him on his feet and asked him if it hurt more to stand up, he said it didn’t. I asked, while rubbing his calves, if it hurt there, he said no. I asked if his foot hurt and rubbed the bottom of his feet, he said no. After a few minutes of this, him still crying and flexing his legs, I determined that we should give him some Advil and that I would lay down with him so he could stretch out. I let him know that I would only be staying until he was relaxed and asleep, and then I was going to my bed, so that if he did awaken later, he wouldn’t freak out because I wasn’t there with him. He calmed down after a bit, still flexing his legs, and as the medicine took effect, he relaxed and curled up against me and drifted off back to sleep. I left his room, concerned, so I started researching on my phone, because I had recently finished a course of Ciprofloxacin, which does transfer to breastmilk in small amounts and one of the side effects of that can be joint development in infants… but my doctor felt that since he’s a nursing toddler he would be OK, and my research at the time of prescription bore that out. However, in my research last night, I came across an article on this site on WebMD about growing pains vs. childhood arthritis. ( http://www.webmd.com/rheumatoid-arthritis/features/growing-pains-or-childhood-arthritis?page=2) It was an informative article, and I felt educated, until I got to the last paragraph. I found myself wondering WHY WebMD decided that paragraph needed to be included… to me, it was such an unexpected inclusion, and was not related to the issues they were discussing at all. In my opinion, it stepped across the line from educating about medical issues to warning about parental choices. I actually felt kind of insulted, because it’s those types of things that lead a parent to not trust your child, to doubt your parenting choices, and can ultimately drive a wedge between you and your child by making a person question whether or not they’re doing the right thing by responding to children when they cry in the night. I have a tendency to look at relationships with a long-term lens and I wonder if these “doctors” factor in the fact that relationship foundations are laid when a child is this age, and what happens when these toddlers are teenagers? Doctors encourage parents to establish boundaries for night time sleep, laying the groundwork for good sleep for the future. I wonder if they ever think about the fact that when kids turn into teenagers, a whole lot of them turn into night owls, and they do the majority of their thinking and emotional growth at night. And what if you, as their parent, are not available? They will find someone to talk to, and it won’t be you. 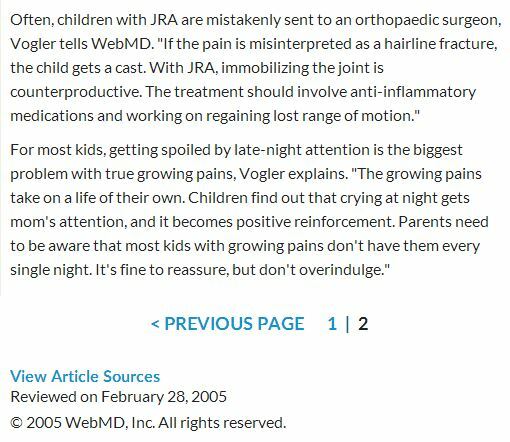 The way I see it is, at this age children are just learning to communicate, and how on earth does Dr. Vogler know beyond a doubt whether children experience growing pains every single night? They might. And even if they don’t, what is wrong with responding to your child when they cry? Just because it may not be a physical need, but an emotional one, does that make their need less valid somehow? In William’s example, I’m still not sure if it was his knees that were hurting him (joint pain), or his bones lengthening, because I’m not even sure how *I* would describe my bones hurting me to someone, and I have a much vaster vocabulary than he does at 3. So, if we (as parents/ adults), assume that a child is getting “spoiled by late night attention” or “overindulged” and refuse to go to them, doesn’t that cut off the ability to communicate, which is the heart of any relationship? Anyway, after researching all this and talking to a couple friends whose kids have had growing pains, I think we’ll take a wait and see attitude on this. Although, now, since I was a late bloomer, I find myself wondering if all the knee pain I had when I was a teenager was, in fact, growing pains. Thanks, Lynne. It was kind of scary and the combo of me having just finished my medicine and the timing of that… made me concerned. Then, the closing paragraph on that article really irritated me. Thanks for the post-midnight summer camp. 😉 xoxo You’re the best daddy and husband ever. mia says she hurts sometimes and she thinks it’s growing pains. if i were as good as mom as you, i’d probably pay more attention and notice if she grows a week or two later… i just massage her legs (and sometimes arms) and let it go at that… lol.